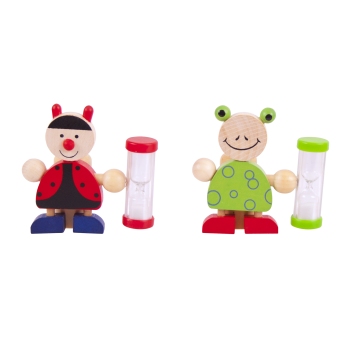 These wooden Animal Tooth Brush Timers will help your little one to learn about the importance of healthy teeth and a thorough brushing routine. With the help of one of these cute wooden timers, little ones will learn all about the three minute rule and have a safe place to store their brush! Not a toy. Made from high quality, responsibly sourced materials. Conforms to current European safety standards. Height: 80mm. One Supplied. Designs Vary.